If you own a Mac and use OS X, you already have that solution. OS X comes with DigitalColor Meter. If you haven’t moved DigitalColor Meter to a different folder, you’ll find it in Applications > Tools. If you can’t find it there, simply use Spotlight and search for DigitalColor. To use DigitalColor Meter, move your cursor over the color you’re interested in and read out the RGB color values. You can get those values as percentages, actual values (8 & 16 bit), and hexadecimal values (8 & 16 bit). 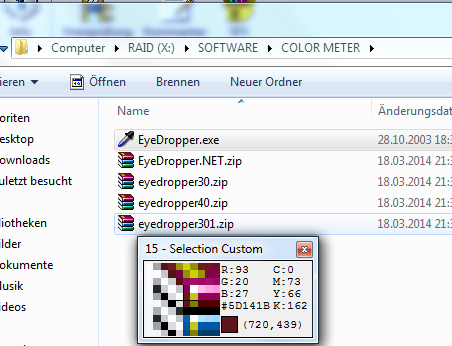 If you’re running Windows on a PC, Eyedropper is a free application that offers the same functionality as DigitalColor Meter. Please send him a „thank you“ mail: info@vizija.si and consider doing a paypal donation!